There is perhaps no greater service to God than being a loving parent or caregiver to a child. But many parents face the tragedy of having a terminally ill child, an unbearable situation that can strip families of their hope and faith. Sadly, many of these children are in the U.S. foster care system – and that’s where some very special people come in. None of us can likely imagine the soul-shattering heartbreak that comes with facing the loss of a child. We all pray we will never know such despair. But for one family, fostering terminally ill children has become a life-long mission of redemption and faithful service to the Lord. Cori Salchert learned the sorrow of loss when she was a child herself. Her younger sister, Amie, lost brain and body functions after an infection of spinal meningitis as an infant. The challenges faced by their parents led them to send Amie to a children’s home who could better handle her care. Tragedy struck, however, when 11-year-old Amie was able to leave the facility undetected and wander to a nearby pond, where she drowned. Cori Salchert wondered where God was for her sister and thought about the fear that Amie must have faced alone in the last moments of her life. It led Cori to become a bereavement nurse for families who had lost newborns and infants. She later started an organization called Hope After Loss as a way to offer support and connect families in their grief. The grief of losing a child can destroy marriages and rip families apart, and some parents cannot face the huge emotional and physical challenges of taking care of their terminally ill child. Cori and her husband first felt led to care for hospice infants in foster care, so these babies might know the unconditional love between parent and child – if only for a moment. 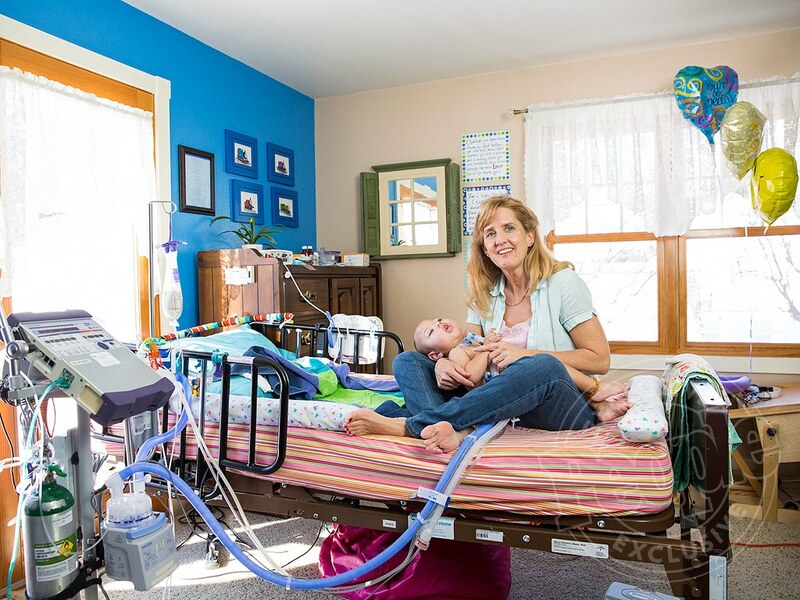 They have eight biological kids of their own, but their love knows no bounds when it comes to these innocent children who have no families to comfort them through illness. Cori and her husband adopted a baby named Emmalyn who lived less than two months, and later, baby Charlie, who was not expected to live past age two or three. Charlie is a fighter and is now almost five, and the Salcherts continue their mission of love. Early last year, Cori learned about a young teenage boy in the foster care system who had a genetic degenerative brain disorder. The family was unable to take the child in at that time due to other fostering obligations. And they had only fostered infants before. The boy, nicknamed “T Bear” was likely never going to be adopted, and Cori couldn’t bear the thought. When the Salcherts were able, they brought him home and gave him the name Samuel. The name means “asked of God” or “heard by God,” and could not have been more appropriate for a woman looking for answers about why she lost a sister so many years earlier. He was hospitalized on many occasions, and the Salcherts even had to go through the stress of a failed attempt by his biological mother to take back his care and custody. But Cori knew that Samuel belonged with her family, and she desperately wanted him to know the love and peace of family surrounding him as he died. They officially adopted him in September of this year. Because Samuel was too ill to attend the adoption proceedings, the judge came to the Salcherts’ home. And so did the numerous medical and law enforcement professionals who had helped Cori care for Samuel or who had simply visited the family to offer support in recent months. Samuel passed away last month as Cori lay next to him. While the family is heartbroken, they knew what they had signed up for when adopting Samuel – just as they understand the pain that will come with losing any of their terminally ill children. They praise God for being called to serve these children in His name – children who may otherwise have died alone without ever knowing the meaning of family. The Salcherts have learned what it means to be redeemed by His love; to live for the purpose of serving others ahead of themselves. Their story is heartbreaking, yes, but beautiful. In a society where there is so much upheaval, division, and hatred at times, their mission serves as a beacon of hope and a lesson for us all. We applaud these families for taking on a sorrow that no parent ever wishes to experience in order to bring a moment of peace and security to a deserving child. What do you think of Cori Salchert and other families who foster and adopt terminally ill children? Leave us your thoughts.